There are a number of powerful web applications such as discussion forums, shopping carts and content management systems that allow you to increase your web sites functionality and attract more visitors to your site. 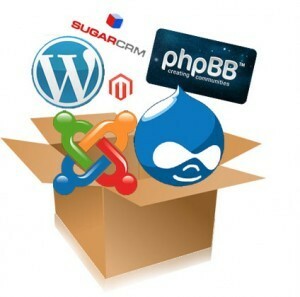 For many web site owners adding these applications can be a daunting task because of the difficulty involved and the technical knowledge required to complete the installation. Fortunately Web24 provides a powerful and easy to use online application installer called Installatron which allows you to install a variety of popular open source web applications into your hosting account with the click of a button. With Installatron you can browse all the available web applications, find information about each one, view screen shots and sample websites and discover links to homepages, documentation, FAQs, support forums and much more. Installatron is freely available for use via cPanel on all of our web hosting plans here at Web24. Installatron provides a simple and intuitive interface for installing software that can be used by even the most inexperienced web site owners. Applications can be installed and managed with a single mouse click, with all of the installation options being presented on a single page. After logging in you will be presented with a list of over 300 applications for installation divided into 17 different categories including shopping carts, content management systems, online discussion forums and CRM systems. You can browse through these categories or use the search bar located at the top of the screen to locate a specific application. The search bar also allows you to locate currently installed applications, cloned sites and backups. When you have found something of interest you can read a detail description about the application, view screenshots and sample websites and review documentation, FAQs, support forums and much more. 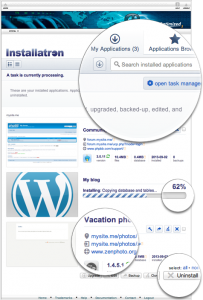 As new versions of your favourites applications become available you can update them easily.If you are using WordPress then Installatron can even help you to update your plugins and themes as well. The option to create a backup is always provided prior to starting any update. A log of the proposed changes will be provided to highlight the differences between each version helping to distinguish between critical security releases, versions that introduce significant changes, and regular minor versions. You can automate this process by allowing Installatron to automatically backup and update all of your applications as updates become available. This can be controlled so that only minor updates or security patches are applied or entire new versions can be installed. If in the event that the update fails, the automatic backup will be restored immediately. Installatron provides a powerful set of tools for helping web site owners and web developers to backup, restore and create duplicate versions of existing web sites. Backups of installed applications can be created, including all the relevant files and databases, to a single compressed ZIP file that can be downloaded to your local computer. Whenever necessary, backups can be restored to return the application to the state it was in when the backup was created, whether or not the original application is still installed. These backups can be enabled when first installing an application, or at some other later point. Installatron’s automatic backup feature will automatically maintain installed application backups based on a schedule that you select. You can create these backups from within your hosting account, or at FTP/FTPS/SSH/WebDAV/Dropbox and other cloud locations. Clone is a new feature that enables installed applications to be duplicated to a different location. Clone can be used to test an upgrade before applying it to a production install, to create a sandbox to test mods, plugins, or themes, or simply to duplicate an installed application. Enhance your website with one of the many free applications available within Installatron today. Order one of our cPanel shared hosting plans and choose the application that best suits your requirements.